Sanatana Dharma as a noun is our Infinite Nature. Sanatana Dharma as a verb is our unchanging responsibility. Our unchanging responsibility is to be our Infinite Nature. Series — Are you ready for…THE HAPPINESS SERIES II? Join us from Mon Dec 3 — Thu Dec 6 from 07.00p-08.30p EST for a unique, interactive, virtual workshop focussing on the universal and practical challenges of: transcending loneliness, time management, internalizing inspiration, conflict resolution, etc. Do you think we can bring together 500 seekers of all ages, all backgrounds, etc. for self development? Please save the dates and spread the word — — The Happiness Series II for All! Support — i apologize for not being able to keep up with writing the E-Vichara. 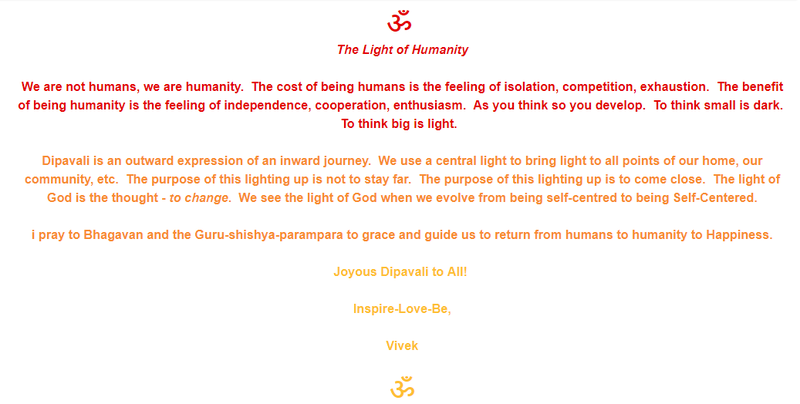 Though i am still behind 3 months, this Dipavali celebrates the completion of 9 years of E-Vichara-s! 9 years of reflecting together!! 9 years of realizing together!!! In Vedantik tradition teachings are given freely. No price can be tagged to the guidance a Teacher offers to seekers to live more purposefully, to kids to try their best, to leaders with material for their classes, offices, etc. Still, filled with gratitude and fulfillment a student seeks to give back. If you feel this Course is worth $0.10 per lesson or $0.50 per lesson or $1.00 per lesson, please donate accordingly. Sadly, funds make the world go round. How? Your generosity will help me actualize my 1 year / 5 year / 10 year plan of serving Sanatana Dharma.